A true gem in North Durham, this all brick three bedroom, two bathroom ranch home sits on almost an acre of serene outdoor space, featuring an open concept with hardwood floors throughout main living areas, brand new carpet in bedrooms, fresh paint, a wood burning fireplace with brick hearth in the family room, a large patio that leads out to the wooded back yard with two storage sheds, and a great closet space in the master bedroom. Home is equipped with Samsung Smart Things Hub and will convey. Act fast on this one before it’s gone! 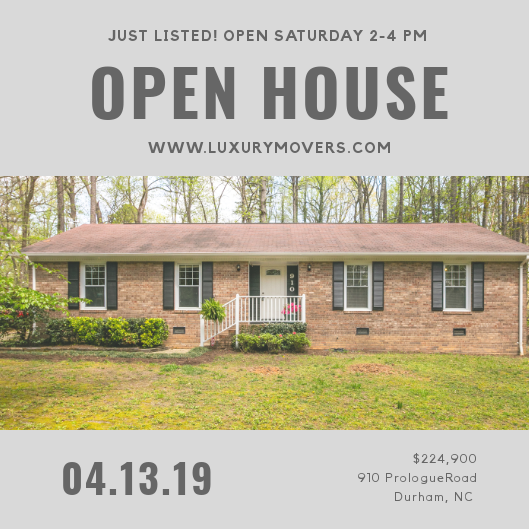 Open house on Saturday, April 13, 2019, 2-4 p.m.
910 Prologue Road, Durham NC 27712 can be found on Google Maps.